LuxCoreRender project is now available on BountySource. It is a funding platform for open-source software. Users can improve the open-source projects they love by creating/collecting bounties and pledging to fundraisers. Check the BountySource FAQ for more information. 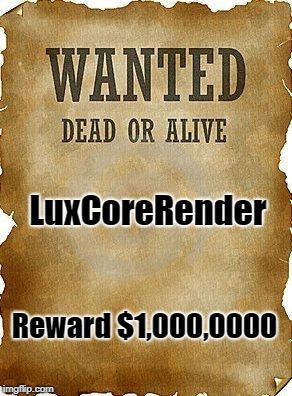 For instance, Mac user could create a bounty for a MacOS version of LuxCoreRender binaries. By gathering some attention around the bounty and putting more bounties on the same issue, it may finally possible to find a MacOS developer. Feel free to post on our forums if you need to ask for help in bounty creation, attract more attention on a bounty, etc. 2) The private developers forum is the place were we discuss if/how/when spend the money received as donations. So, if you are a donor, you are entitled to know and express your opinion about what it is done. 1) An active recurring monthly donation of 5$ or more (anything less is a donation to PayPal/BountySource, not to this project). 2) One time donation of 50$ or more. 3) The topics discussed in private developers forum are usually there for a reason so the should be discussed only there. Follow the forum rules and etiquette (or you will be kicked out, no matter what). If you are eligible for the new rank, send me a forum Private Message with your BountySource name and I will promote you.